Summary: In Philadelphia, good girl Kate is dumped by her fiancé the day she learns she is pregnant with his child. In New York City, beautiful stay-at-home mom Vanessa finds herself obsessively searching the Internet for news of an old flame. And in San Francisco, Dani, an aspiring writer who can't seem to put down a book—or a cocktail—long enough to open her laptop, has just been fired . . . again. My beach vacation is still a few weeks away, but I actually read a novel a few weeks ago that is absolutely, positively perfect for a beach read. 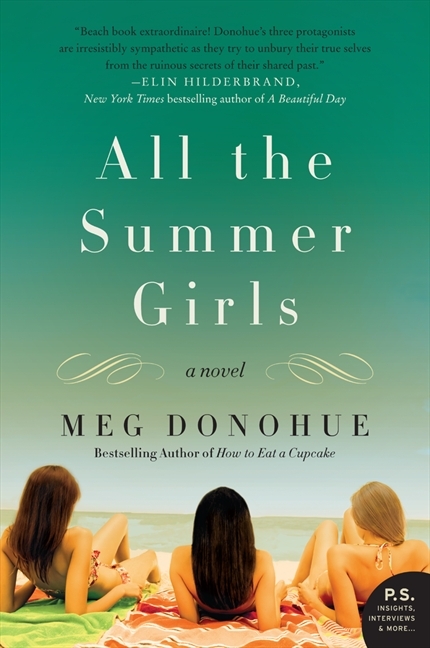 It's called ALL THE SUMMER GIRLS by Meg Donohue; and not only is it a book about female friendships, but it takes place at the Jersey Shore. I can pretty much guarantee that this novel will be the perfect addition to your beach or pool bag. ALL THE SUMMER GIRLS tells the story of three friends -- Kate, the perfectionist lawyer who finds herself pregnant and dumped by her fiance; Vanessa, a stay-at-home mom who is looking for a little excitement in her life; and Dani, a writer who is experiencing a serious case of writer's block along with a penchant for alcohol. The three women agree to meet at the Jersey Shore where they spent their summer together. As they try to come to terms with their current situations in life, they also discover that a traumatic event from their past has affected each one of them more than they realize. I enjoyed ALL THE SUMMER GIRLS quite a bit. For those of you who know me (or regularly read my reviews), you already know that I'm a sucker for stories about women and especially as it relates to their friendships with each other. Furthermore, I appreciate books where the main characters find themselves facing difficult times and have the courage and strength to change or evolve. So given my inclination towards stories like this, I was entertained by ALL THE SUMMER GIRLS. In fact for much of the novel, I was impressed with Ms. Donohue's grasp of women's feelings and how she portrayed these characters. There were a few times when I thought the characters were almost stereotypes of "friends" and then something would occur that would change my mind. I especially liked that I was surprised by the complexity of their characters. So while I said earlier that ALL THE SUMMER GIRLS is an ideal beach read, keep me mind that it does deal with some serious issues and it's not just a light and fluffy story. Having said that, I do think ALL THE SUMMER GIRLS would make a good book club selection. I'm sure I'm not the only one who feels that way about the ending, so that would be interesting to discuss. Furthermore, the characters' actions are most definitely interesting and perhaps even controversial. Some of the topics you might want to explore include friendships, parent/child relationships, new beginnings, honesty, guilt, forgiveness and redemption. Overall, I enjoyed ALL THE SUMMER GIRLS and think it's a terrific summer read. Recommended to fans of women's fiction and smart chick lit. This is on my list! Despite the neat ending, how can I resist a book that takes place at the shore? I love books about women's friendships too - they're so much more complicated than men's. I don't mind neat, tidy endings and rather enjoy them at times. sounds like a good summer book! I also like books about female friendships and I agree that it's fun to read beach books to get into vacation mode. I did a shore house at Spring Lake for years and this book seems to capture that experience completely! I am meeting them all for dinner on the 7th and will recommend this one!